Before you begin the installation process, you should check to make sure the computers you are installing XpertMart on comply with our minimum hardware requirements. Installing XpertMart™ on a computer that does not meet our memory or processor standards will cause the software to run slowly and may even create errors. We cannot give you adequate technical support if you do not meet our hardware requirements. Each of these folders represents one step in the installation process. 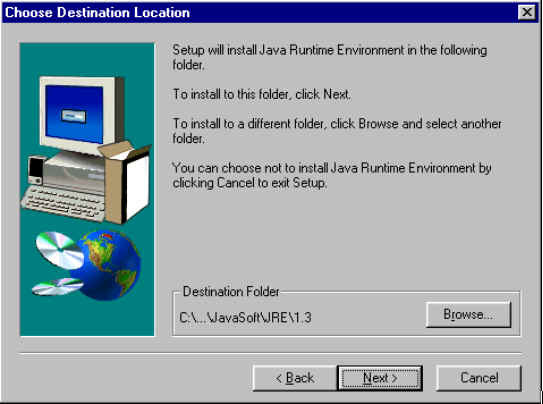 Since XpertMart™ was written in the Java programming language, we begin by installing the JRE or Java Runtime Environment which allows us to run Java applications on our computer. 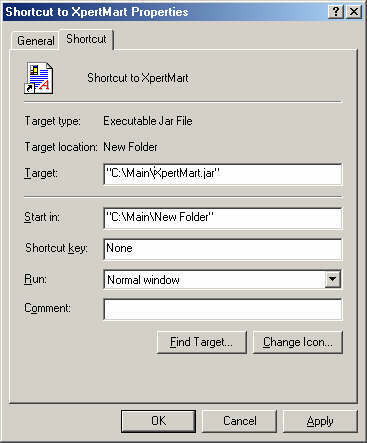 Note that it is very important that you only use the JRE version currently being used by XpertMart™ which is found in the installation folder. If a newer version of the JRE becomes available and you download it before we have released a version of our software that is compatible with it, you could experience some technical difficulties. As of the writing of this User's Manual, we are using version 1.5 of the JRE. If you have any doubts about what version of JRE you should be using, contact your XpertMart™ dealer. You need to install the version of Java that corresponds to your operating system. If your operating system is 32 bits then you install the Java that ends with i586. If your operating system is 64 bits then you need to install the Java that ends with amd64. If you double-click on this auto-executable file, it will begin to install. You will need to choose to select the install options. Specifically you have to select the folder into which Java will be installed. You need to install Java into the C:\Java folder. You will also see is the Software License Agreement from Sun Microsystems, the maker of Java. Be sure to read the License Agreement carefully and Click <Yes> to continue the installation. Here it is very important that you not choose the default folder but instead create a new one. You do this by clicking on the <Browse> button which will open the Choose Folder window. In the Path field you will need to type "C:\Java" and press <OK>. Now that we've defined the location, click <Next> and the wizard will proceed to install the JRE in the new folder you have created. Once again, all you have to do is watch as the wizard finishes the installation. When it is complete, you should see a window that says "Installation Completed." Click here to see how you can test to make sure Java was installed properly. If you are installing a demo version of XpertMart (tm), the Single Store edition or a Remote that will all be on one machine then you will need to install the Firebird database server. If you are installing a workstation or are going to use a dedicated computer to run the database then you do not need to install the Firebird database as part of this intallation. The next step is to install the database manager Firebird. (If you prefer to use a different database manager, contact your XpertMart™ dealer for help with the installation). Firebird is the program that will actually manage the storage of all of your data. The version of Firebird you should install will depend on your operating system. If you are using a 64 bit operating system then you should install the file that ends with x64. If your operating system is 32 bits then you should install the file that ends with Win32. Once you double-click on this auto-executable file the first screen of the Install Wizard will open up. You can accept all the defaults for the installation of Firebird, including accepting the license agreement. Copy these two directoies and paste them into the root folder of the C:\ drive. The Java folder contains the drivers needed to run peripherals from XpertMart™ while the Main folder contains the actual application. When you paste these folders into C:\ the files will automatically be stored in their appropriate directory. If you get a message saying that one or more of these files already exists in the C:\ drive, go ahead and paste them as there is no harm in overwriting the same file. When you are finished copying the three folders you can go to the C:\Main directory and double-click on it to see its contents. Click here to see how you can test to make sure Firebird was installed properly and the database is functioning correctly. Double click and run this installer program. You can just accept the license agreement and all the default options. The HASP key plugs into a USB port. The USB port HASP is a "Plug and Play" device and requires no special software to install. When you insert the HASP into the USB port your computer should detect the HASP automatically. You know the HASP was detected and is working when a red light comes at the end of the key. If for any reason the light does not turn on, try restarting your computer and plugging the key in again. You can also follow the instructions for installing the HASP software. Also, be sure to check the key to make sure it is not damaged. USB keys are very fragile and can malfunction even if bent slightly. Depending on the configuration of your system and web browser this page may or may not open up. If you cannot get it to open and have an additional web browser then try opening it with the other web browser. If you cannot get this to open with any of your web browsers then contact XpertMart technical support at support@xpertmart.com or any phone number on our web page. You need to remove both check marks shown. Once you have removed these click on the submit button further down the page. Here you also want to uncheck the checkmark shown. Once you uncheck this then you click on the Submit button. You can go back to the first tab and make sure the checkboxes remain unchecked and then back to this tab and make sure this checkbox remains unchecked. Once you have done that you can close the web browser. Browse to C:\Main\XpertMart.bat and select that. Note: Do not select XpertMart.jar as it needs additional parameters from the XpertMart.bat file to run correctly. On the properties window there is also a line that says "run". Select minimized there. When you click <OK> and exit the Properties window, it will take a few seconds for the new icon to appear. If you have followed all of the steps of the installation process and successfully installed the Jave Runtime Environment, Firebird, XpertMart™ and the HASP, then you are ready to use the system. To launch XpertMart™, go to the C:\Main directory and double-click the XpertMart.jar file. If a Login Window appears asking you for your user name and password, you have successfully completed the installation process. You can click <OK> without entering a user name nad password and you will enter XpertMart™ 's main screen. 1) There is no HASP or the driver for the HASP is not working. You know this is the problem is you see this window. If this is the case, go back and check to make sure the HASP was installed correctly. 2) XpertMart™ cannot read the database. The Login Window appears on the screen, but after you click <OK> nothing happens and you do not see XpertMart™ 's main screen. This means that XpertMart™ cannot read or write to the database. You must remove the database's write protection. 3) XpertMart™ cannot run because there was a problem with either Java or Firebird. You know this is the case if after double-clicking on the XpertMart.jar file the Login Window never even pops up. If this is the case, contact XpertMart technical support at support@xpertmart.com or any phone number on our web page. Congratulations, you have finished the installation.